Thank you very much for choosing BBC Scotland as your provider of Scottish football updates, commentary, facts, opinions, humorous contributions, photos and quotes. It is greatly appreciated. All the best. Well, quite a night for Hearts fans and not a bad old evening for those at Kilmarnock either. We'll be publishing highlights of the matches at Tynecastle and Rugby Park at midnight. Tomorrow afternoon we'll add the best bits of Inverness Caley Thistle's draw against Partick Thistle. The Kilmarnock players celebrate Kallum Higginbotham's cheeky penalty kick.Image caption: The Kilmarnock players celebrate Kallum Higginbotham's cheeky penalty kick. "I always felt we could get something from the game although we had to weather a wee storm. I am well aware of Jamie's capabilities but you expect your keeper to do that. [On Kallum Higginbotham] One thing about the lad is that he is confident. I told him to relax a bit and he showed the Kallum Higginbotham that was at Partick Thistle last year. We've got a lot of talented young players at the club. The last time out here I had to apologise to the fans for the performance but tonight hopefully they are going home happier." Kilmarnock's Kallum Higginbotham scores with a sublime penalty to beat Craig Gordon.Image caption: Kilmarnock's Kallum Higginbotham scores with a sublime penalty to beat Craig Gordon. Nicola, Falkirk: "What was John Collins saying about no competition?" Gordon Lyle, Drylaw: "Go on the Jambos, treble looking good, what's Hibs favourite bbc 1 tea time quiz programme called? U got it, Pointless." Neil, London: "Great to see Jambos having a very pleasing start on return to Premier. Early days but all the signs are promising." Andy in Armagh on Higginbotham's penalty: "Pressure? What pressure? That takes nerve!!" "We gave away way too many goal chances. That was disappointing. We should have been more disciplined. We should have led by two or three going in to the break. Kris [Commons] has a dead leg and with James Forrest it's a little thing in his knee. We can defend, we have good players, but it's disappointing that we are lacking discipline. We need to be 100% switched on, defensively and offensively. It's always tough. We take one point - we wanted three but we didn't deserved any more. [On Van Dijk transfer interest] We don't need to sell him." "Kilmarnock needed something to build on. This kind of result will lift everyone. It's a massive point for Killie." [Celtic play Malmo in the Champions League play-off round] "Celtic rested a few players. I have seen them a lot. I know they are a good side." "I thought for Celtic James Forrest was a stand-out but he was was taken off but Jamie MacDonald was there time and time again to stop Celtic." Hearts head coach Robbie Neilson gives the thumbs up, as well he might with Gavin Reilly and Billy King scoring to secure a 2-0 win over Motherwell.Image caption: Hearts head coach Robbie Neilson gives the thumbs up, as well he might with Gavin Reilly and Billy King scoring to secure a 2-0 win over Motherwell. "The chances we had in the first half, we should have had double figures. Jamie MacDonald had a great save in the first half and two or three in the second half, a few from myself. It's one of those games. It's a soft penalty we gave away." It's maximum points for Robbie Neilson's side, with three wins in a row. Has no-one told the Gorgie men they're playing in the Premiership, not the Championship like last year? They're looking good. Liam Lindsay saves the day for Partick Thistle as the young defender gets back to head the ball away after Andrea Mbuyi-Mutombo lifts the ball over goalkeeper Tomas Cerny. 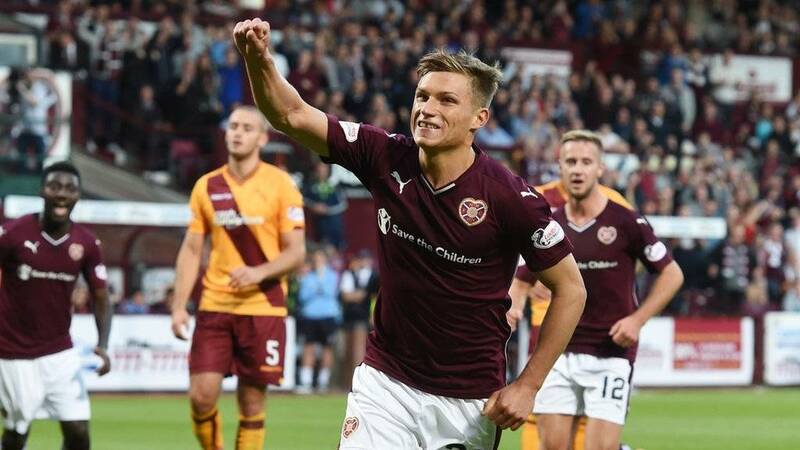 Celtic drop their first points of the season and, unless Motherwell do something remarkable at Tynecastle, it is Hearts who will top the Premiership this evening. Ryan Christie and Andrea Mbuyi-Mutombo both have efforts blocked in front of goal as Caley Thistle press for a winner. We're in the final minute of added time at Rugby Park. Motherwell are under pressure at the back, giving the ball away to Billy King, whose tame shot from a tight angle squirms free from Connor Ripley's grasp. The goalkeeper recovers in time to seize the ball before it rolls in. David Clarkson replaces Scott McDonald for Well as the visitors go all-out for an unlikely comeback and the substitute makes an immediate impact, launching a dipping volley over Alexander's crossbar from the edge of the box. Kallum Higginbotham does a "Panenka", waiting for Craig Gordon to dive to his right before dinking the ball over the stranded keeper to pull Killie level. Outstanding. Callum Paterson congratulates Billy King, scorer of Hearts' second goal.Image caption: Callum Paterson congratulates Billy King, scorer of Hearts' second goal. Celtic sub Charlie Mulgrew (on for James Forrest) darts in to follow up on Jamie MacDonald's save from Leigh Griffiths and knocks the ball into the net but the linesman has his flag up. Dom Thomas replaces Louis Moult as Ian Baraclough's Motherwell go in search of a comeback. Tomas Cerny denies Caley Thistle again as the goalkeeper saves with his feet with Danny Williams racing clear. Juanma just fails to add to his early season tally as he lunges after Callum Paterson's teasing, swerving cross from the right wing, failing to connect at the back post. Iain Vigurs goes close to a debut goal for Caley Thistle as his free-kick aimed at the bottom left corner is turned away by the hand of goalkeeper Tomas Cerny. Craig Gordon saves from Killie sub Mark O'Hara's header at the back post as the home team put pressure on Celtic with 11 minutes to go. Michael Duthie: "Good to see Josh Magennis is quick enough and smart enough to punish Celtic. #bbcscotfootball"
Stephen Hay: "This is the best early season form #Celtic have had for several years." Caley Thistle begin to threaten and, when Andrea Mbuyi-Mutombo has an effort blocked in front of goal, Danny Williams narrowly misses the top corner with the rebound. Celtic left-back Emilio Izaguirre shows a good turn of pace to find time and space to loft a cross in for Leigh Griffiths, whose bicycle kick drifts a foot or so wide of the post. "It was a measure of the task facing Motherwell when 15 minutes after the interval Hearts brought on their top scorer in Juanma. Motherwell had been more assertive, but they cannot match the Tynecastle side's powerful intent and Billy King deserved his goal to put Hearts two ahead after several passages of individual skill. The outcome now seems assured, with Hearts starting the season strongly and boldly." Kilmarnock's Aaron Splaine is on for Scott Robinson because of an injury. Ian Baraclough sends Jack Leitch on for Motherwell, with Keith Lasley coming off. Celtic celebrate Nir Bitton's goal, a strike that gave Killie goalkeeper Jamie MacDonald no chance.Image caption: Celtic celebrate Nir Bitton's goal, a strike that gave Killie goalkeeper Jamie MacDonald no chance. Some entrance Iain Vigurs has made on his return to Caley Thistle as the midfielder goes is booked 60 seconds after coming on after a challenge on Abdul Osman. Caley Thistle's frustration leads to Greg Tansey being booked, while new signing Iain Vigurs replaces Lewis Horner in midfield. A lovely jinking run from new signing Juwon Oshaniwa, and a neat crossfield pass from Buaben sets up Billy King, who cuts inside and drills his shot into the bottom corner. Connor Ripley gets hands to it and should really have done better, but can't keep it out. Celtic goalkeeper Craig Gordon is at full stretch, save for the classically arched back, as he reaches up and back to tip over Rory McKenzie's dipping shot. Partick Thistle's Liam Lindsay battles with Dani Lopez of the Caley Jags.Image caption: Partick Thistle's Liam Lindsay battles with Dani Lopez of the Caley Jags. That man Sam Nicholson is at it again - he receives a Prince Buaben pass in the centre circle, knocks the ball ahead, and is hacked down by Motherwell's Jake Taylor, who is booked. Steven Lawless goes close for Partick Thistle, the midfielder's powerful drive being touched on to the crossbar by goalkeeper Owain Fon Williams. Hearts launch a counter-attack from a Motherwell corner, culminating in Gavin Reilly cutting inside and sending a right-foot shot straight at Connor Ripley. Caley Thistle forward Dani Lopez fires one from 20 yards, but the Spaniard's shot goes just wide as the attendance in Inverness is announced at 3,141. "That comes in to the blockbuster category from Nir Bitton!" Kilmarnock pay the price for giving the Israeli Nir Bitton too much space 25 yards from goal as he cracks a peach of a swerving shot into the top corner. What a strike! Killie's strapping centre-half Mark Connolly seems to be struggling with an injury. Partick Thistle defender Stuart Bannigan goes into the referee's book for a trip on Caley Thistle midfielder Lewis Horner. Striker Leigh Griffiths seems to be caught in two minds as the ball comes in to him eight yards from goal - his attempt is neither a volley, half-volley or sweep, but more of an "ushering in". It goes wide of the Killie goal, in any case. Motherwell fly out of the traps at Tynecastle. Lionel Ainsworth jinks smartly past a wild challenge in the Hearts box, but his low, driven cross is diverted away from goal. Kilmarnock concede a free-kick 25 yards from goal and must surely have been fretting as Virgil van Dijk eyed up the goal. However, his attempt blasts off a player in the Killie wall. We're off and running around the country again. Josh Magennis is congratulated on his leveller for Kilmarnock.Image caption: Josh Magennis is congratulated on his leveller for Kilmarnock. I can't decide which manager at Rugby Park will be the more perplexed. Ronny Deila will be scratching his head as to how his Celtic team are level with Killie, who they outplayed for 30 minutes, while Gary Locke will be just as puzzled, though Josh Magennis did have another fabulous chance to score. Into stoppage time at Caledonian Stadium and home goalkeeper Owain Fon Williams concedes a corner as Kris Doolan comes close. Just before the half-time whistle blew, Prince Buaben was caught in possession deep in Motherwell territory, and the visitors broke with verve. Lionel Ainsworth was haring unmarked through the middle, but his teammates spotted his run too late, and the ball beat him out of play for a goal kick. Hearts hold a hard-fought advantage and will feel that the pace, elusiveness and directness of their front men and wide players will deliver more chances. Motherwell have only threatened on the counter attack, but without ever looking certain that they would create a chance. At this stage, a home win looks likely and the onus is on Motherwell to change the dynamic of the game. There's a brief delay in the Highlands as the sprinkler behind the goal goes off. I fail to believe that there hasn't been enough rainfall in Scotland this summer. He missed a sitter moments ago but he has made amends now. Josh Magennis gets across his marker to turn the ball past Craig Gordon following Darryl Westlake's low cross. Oh, boy! Kilmarnock will be relieved if they can get in to the changing room at 1-0. Virgil van Dijk heads for goal, then Tom Rogic has an effort that comes off the post and somehow Killie clear it. A Motherwell corner is tantalisingly left by the Hearts defenders, who stare at one another as the ball floats over their heads towards Louis Laing, who swings and misses with a right-foot volley. Lee Ashcroft drifts in at the back post to meet Stevie Smith's free-kick from the right, catching the Celtic defence out, and heads at goal from inside the six-yard box. Craig Gordon sticks out a boot and makes a wonderful instinctive save. From nowhere, Killie have created two chances. After Scott McDonald's error, Motherwell go straight up the other end and Marvin Johnson fires a somewhat speculative left-foot strike straight at Neil Alexander." Killie striker Josh Magennis finds himself in an acre of Ayrshire turf and makes a dash for goal. With Virgil van Dijk galloping behind him, the big Ulsterman opens up his right foot and sends an effort high over the Celtic crossbar. That was Killie's best (only) chance. Christopher Piras on Facebook: "Kilmarnock have no chance tonight, 3-0 Celtic. Hearts and Caley will probably get narrow wins, 2-1 for both games." Gavin Reilly slots home a penalty for Hearts after Sam Nicholson had been brought down by Scott McDonald. Sam Nicholson is once again proving the bright spark at Tynecastle. His dancing footwork earns a free-kick near the goal-line on the left of the Well box...and a booking for Louis Laing. The visitors clear, though. Celtic are forced into a change. Gary Mackay-Steven comes on for the injured Kris Commons, whose left thigh we can now see is taped up with that fancy stuff physios use but which could well be run-of-the-mill electrician's gear. Killie's difficulties have been highlighted by Josh Magennis being released into the Celtic half to chase a ball. The big Killie striker is completely isolated and with Virgil van Dijk the closest of three Celtic players checking his progress, he does well to win a corner by booting the ball off the Dutchman's leg. Stefan Johansen, Celtic's captain this evening with Scott Brown and Mikael Lustig absent, arrows a left-foot shot a fraction over the Kilmarnock bar after the home side only half cleared a corner. "Both teams are comfortable in possession but are struggling to create chances." "There's just been a loud and sustained minute's applause from the home fans and players at Tynecastle, in the 14th minute, in memory of Peter Ashton, a 14-year-old Hearts fan who lost his fight with cancer last week." "Confidence is oozing through the Celtic team. When they lose the ball they work hard to get it back, but when they've got it they are so far superior." There are no goals yet in the matches between Hearts and Motherwell at Tynecastle, and Inverness and Partick Thistle. The Kilmarnock defence are standing off Celtic as if the visitors are carrying a plague! Leigh Griffiths had an age to weigh up his options before sending a swerving shot towards the Killie goal where MacDonald makes - how many is it now? - his fourth save. Midfielder Tom Rogic is next to test Jamie MacDonald with a shot, taking advantage of hesitance in the Killie ranks. "Kilmarnock's forwards have really got to be on their toes and get ahead of their Celtic markers." Kiilie goalkeeper Jamie MacDonald is down smartly to stop Kris Commons' slightly fluffed drive from 18 yards. The home side really need to catch a grip or they could be in for a spanking. Inverness CT: Fon Williams, Raven, Devine, Draper, Williams, Mbuyi-Mutombo, Tansey, Polworth, Horner, Christie, Lopez. Subs: Esson, Tremarco, Wedderburn, Jason Brown, Sutherland, Vigurs. Partick Thistle: Cerny, Miller, Frans, Lindsay, Booth, Lawless, Osman, Bannigan, Welsh, Amoo, Pogba. Subs: Seaborne, Doolan, Stevenson, Scully, Wilson, Hendry, Fraser. Super-alert Kris Commons pings a free-kick over the top of the static Killie defence and on rushes Leigh Griffiths to get on the end of it and poke the ball past Jamie MacDonald to give Celtic the lead in under two minutes. Hearts: Alexander, Paterson, Ozturk, Igor Rossi, Oshaniwa, King, Gomis, Buaben, Nicholson, Sow, Reilly. Subs: McHattie, Walker, Hamilton, Oliver, Delgado, McGhee, McKirdy. Motherwell: Ripley, Law, Laing, McManus, Hammell, Ainsworth, Taylor, Lasley, Johnson, McDonald, Moult. Subs: Twardzik, Chalmers, Kennedy, Clarkson, Jack Leitch, Thomas, Cadden. Kilmarnock kick off the match at Rugby Park. Some Celtic fans have let off a green flare in the stand at Rugby Park. Three of Ayrshire's finest constables are on their way up the steps to investigate. Kilmarnock and Celtic are about to emerge from the narrow tunnel at Rugby Park, like toothpaste squeezed from a tube. "We never really got started against Celtic so we're looking for a lot more tonight. Mathias Pogba brings a different dimension to our attack. He's big and he's physical. As long as you get a supply to him, he'll score goals. Our team has a lot of energy and we need to use that. We got a great victory up here last season. We need to impose ourselves on the game. Whoever gets the ball down, passes the ball and is the most creative will win the game." On Twitter, the hashtag to use is #bbcscotfootball. To get involved in tonight's coverage, you can text 80295. Kick-off in the three Premiership games this evening is at 19:45 BST. "Gavin Reilly has surpassed my expectations of him. It's a great chance for him to make his debut at Tynecastle. It's been a good start. It's a cliche but we just want to take one game at a time. We scored a lot of goals last year and I'd like to think we'll score a lot again this year. It's a midweek under the floodlights at Tynecastle - it's a great place to play football." Live commentary of Kilmarnock v Celtic is available on BBC Radio Scotland 810MW, DAB digital radio and here, via the 'Live Coverage' tab. "We're utilising the squad. Wes Fletcher took a bang on the ankle so Louis Moult comes in for his first start. I know it will be a packed house tonight. I'm looking forward to the noise the fans will make. Evening games are a totally different feel to games at three o'clock at the weekend. We're quite happy where we are in terms of fitness and understanding of each other's games. We're away of the threat that Hearts pose. They have carried on the momentum from last season, but hopefully we can come here and be inspired by the tightness of the pitch and the occasion." Kilmarnock: MacDonald, Smith, Hamill, Connolly, McKenzie, Robinson, Higginbotham, Westlake, Ashcroft, Kiltie, Magennis. Subs: Davies, Barbour, O'Hara, Splaine, Hodge, Hawkshaw, McLean. Celtic: Gordon, Janko, Ambrose, Van Dijk, Izaguirre, Bitton, Johansen, Commons, Rogic, Forrest, Griffiths. Subs: Bailly, Mulgrew, Fisher, Henderson, Mackay-Steven, McGregor, Stokes. "It was a big blow for us, with Chris Johnston doing his cruciate and Kris [Boyd] has rolled his ankle. We were really poor against Dundee. It's disappointing because the pre-season had gone well. After 12-13 games we'll have a better idea of where we're going to be. We've got a squad that we feel can do well this season. Look at Celtic's bench, they are really strong, but we've got to stamp our authority on the game and try to be positive." Kilmarnock are without the injured striker Kris Boyd - big Josh Magennis comes in to replace him. Tonight, Celtic and Hearts are both in pursuit of a third straight Scottish Premiership win. Champions Celtic visit pointless Kilmarnock while Hearts host Motherwell. Inverness Caledonian Thistle and Partick Thistle are both still looking for a first win of the league campaign in their meeting in the Highlands. St Johnstone and Ross County each took a point from their encounter. You can watch action from those matches using the 'Highlights' tab. Good evening and welcome to this evening's live Scottish football coverage.